Do I need a heatsink on my linear regulator? 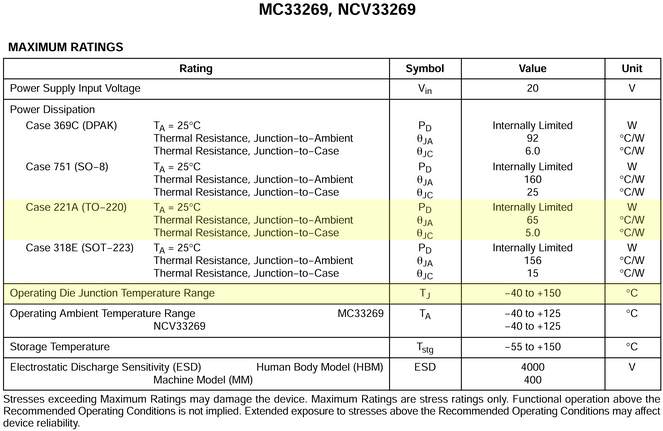 Looking at the excerpt from the datasheet the Junction-to-Ambient Thermal Resistance for the MC33269 in a TO-220 package is 65°C per Watt. This thermal resistance specifies the temperature rise, per Watt of power dissipated, when the device is operated without heatsinking or forced cooling. For every watt dissipated the junction temperature will rise 65°C. If your system is operating at an elevated temperature you need to change the 25°C value in the previous equation. If you calculate a junction temperature that is below 80% of the Maximum Operating Die Junction Temperature you do not need a heatsink. However, a heatsink will increase the reliability of your system by reducing the operating temperature of the regulator.